Brief Synopsis – Based on the true story of the friendship between two teenage girls in 1950’s New Zealand and how they ended up taking revenge when they were separated from one another. My Take on it – I have been a Peter Jackson fan ever since he took us on a journey to Middle Earth 16 years ago, but never really got around to seeing his older films. This film is one of his first ones and he co-wrote it with his wife Fran Walsh (like the LOTR films) and is based on a horrific true story. The idea to mesh together fantasy and reality works well in Jackson adept hands and I would think that he is one of the best choices to do such a thing. Melanie Lynskey and Kate Winslet both made their feature film acting debuts in this movie and both do a wonderful job giving us the strange relationship that the two characters had. The problem is that this film is quite dark and leaves a lingering feeling after it is over because it is done extremely dark which in some ways is frightening because this really did happen. The story moves along too slowly though and in some scenes it makes it through quite haphazardly toward the end of the story. This is definitely not the kind of movie that I can see myself watching again because it is done so disturbingly. Bottom Line – Interesting idea about the meshing of real and fantasy. Lynskey and Winslet are both great here, but the film leaves a strange aura due to the way it was filmed. Fine effort by Jackson and Walsh, but it trickles along too haphazardly on its way to the end. Not the kind of movie that I would venture to see again because it’s a bit too dark for my taste. I think I just get so caught up in the dark fantasy moments that the pacing doesn’t bother me. It is definitely a disturbing flick, but I have a soft spot for it. I loved the pacing. I loved these characters. I loved Peter Jackson. Shame he went on to do Lord of the Rings. Imagine what kind of strange dramas like this he would be making instead? Seriously. 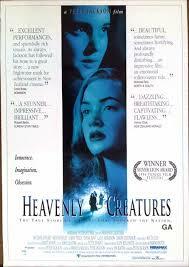 I love Heavenly Creatures. While I started off with Dead Alive and Meet the Feebles, this amazing true crime story was a huge departure and (at the time) I thought a great sign of things to come. I even would have preferred more splatstick horror than the overly CG Hobbit and King Kong stuff. I can understand that this isn’t a film for everyone because of how disturbing it is. But I really found it compelling, especially with how the fantasy and reality collided. Lynskey and Winslet really sold that intense friendship so well in my eyes.